New Plymouth is for the indecisive. By that, we mean New Plymouth has a bit of everything: the coast, the city, and the mountain. What’s more, which makes New Plymouth so unique in New Zealand, is that it provides the best of those landscapes. A common phrase used to describe the city is that: “You can ski in the morning and surf by the afternoon.” Discover more things to do in New Plymouth in this New Plymouth guide for backpackers! That’s right, there’s a great big volcano forever in sight of the city, which holds the wild Egmont National Park. Go skiing in the middle of winter, hike in the “Goblin Forest” all year round, or go on a multi-day hike around Mt Taranaki in summer. If you prefer to be closer to sea level, then New Plymouth has a number of surf beaches easily accessible from the city! Meanwhile, the city has an art scene like no other in New Zealand. Not only are we talking large art galleries, but a community art scene where those on a working holiday in New Zealand have plenty of opportunity to get involved. Whether it’s an art gallery in the back of a barber shop or a pop-up music gig in your hostel, there’s always something artsy going on in this happening city of New Zealand. Surf at Fitzroy Beach while taking in the view of Mt Taranaki. Marvel in the contemporary art and architecture of the free-entry Govett-Brewster Gallery. Go to a community art gallery event for drinks, socialising and local art. Learn about the Taranaki region at the free-entry Puke Ariki Museum. 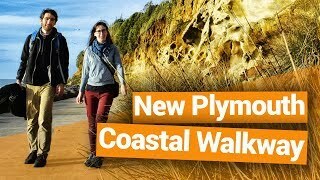 Hire a bike and cycle along the Coastal Walkway. See a waterfall, waterwheel, lakes, birds, gardens and more at the city’s Pukekura Park. Take a day trip to the Egmont National Park for hikes, hikes and more hikes! Surfing could never be so convenient. The surf beach of Fitzroy is well within walking distance on the west side of New Plymouth city centre. Access is from Beach Street or along the Coastal Walkway. Talk to any local or any long-termers staying in your hostel and their day is likely to end with a surf. The surf here is good for all levels of experience. On the east side of town, tucked behind the towering Paritutu Rock, you have Back Beach. Usually offering bigger waves than Fitzroy. From then on, surfers have the luxury of the whole Surf Highway 45 ahead of them where almost every beach has surf. Oakura, just 10-minutes drive out of New Plymouth has a number of breaks (on a good swell). It’s also worth checking out the break at the end Timaru Road, on the north end of the beach. (Yes, you’ll see a shipwreck on this beach too)! For more ways to get out on the water, go on a kayaking tour to the Sugar Loaf Islands where seals are known to join kayakers on their journey, or hire a stand-up paddle board for a paddle in the sheltered waters of Port Taranaki from Ngamotu Beach. Alternatively, Lake Rotomanu is popular with stand-up paddle boarders. When you initially hear about New Plymouth, it’s likely that Mt Taranaki and the surf have stolen the limelight. However, when walking around the centre of New Plymouth, it becomes very obvious that the art scene is huge here! Spray-painted murals cover buildings, from colourful native birds of New Zealand to abstract art. Every year, new murals appear around the city centre thanks to the Get Up Festival, where crowds can watch the street art live. The festival usually happens during the Taranaki Anniversary (see more in Public Holidays in New Zealand). A number of sculptures can be seen across the city, the most famous of which is Len Lye’s Wind Wand, a kinetic art piece on the Coastal Walkway. Watch this 40m structure sway in the wind! Len Lye is a big name in the New Zealand art world, to which a lot of his work can be viewed in the Govett-Brewster Art Gallery on the corner of Queen Street and Devon Street West. It’s Ok to be drawn to the contemporary art gallery by its striking mirror-like exterior because it’s free entry! Exhibitions change three times a year, so expect the unexpected! From large galleries, to small galleries. A walk around the city centre will inspire you to walk into buildings with “Pop-up Gallery” signs. KINA NZ Design + Art Space is a shop/art gallery with regular exhibition opening nights. Go down for drinks and celebrate some local talent! Similarly, the Gallery at Jetcharm on the corner of Egmont Street and Ariki Street puts the “hidden” in “hidden gem” as the small community gallery sits in the back of the barber shop and up the stairs. (Just go into the barber shop and ask to see the gallery). The gallery, which was established by a working holidaymaker from the US, holds an opening party every first Thursday of the month. Not only is it a social event to meet locals and fellow travellers, but you may even be inspired to submit your own artwork! Music, festivals, art, food, history: whatever is your cultural jam, you’re likely to find a part of it in New Plymouth. Check out the free-entry Puke Ariki Museum on Ariki Street. The museum is packed with natural and social history exhibitions from the Taranaki region. See bones from whales and moas, an extinct bird species from New Zealand. Learn about the fascinating Maori history of the region, as well as the story behind Mt Taranaki. Plus, there’s free WiFi at the museum! For a light show like no other, time your visit to New Plymouth with The Festival of Lights between mid-December and mid-January. Pukakura Park, a city park which is stunning on its own, is lit up with amazing light shows, as well as being the host of live gigs and cultural events. For a cheap music gig and general good vibes, keep an eye on the Pop-Up Gigs Network Facebook page. Anytime, any place, a gig will be held somewhere in the city where everyone is invited to bring some food for a pot luck dinner and mingle while listening to some good tunes. (Try these 5 Potluck Dinner Recipes for Backpackers). The one that’s on everybody’s list is the Coastal Walkway. 12.7km of New Plymouth’s coastline are dedicated to putting one foot in front of the other, featuring Len Lye’s Wind Wand, a hilarious road sign, the Te Rewa Rewa Bridge and much more! Although many people like to walk the walkway, we recommend hiring a bike to complete the entire coastal walkway. Easily accessible from the city centre, it is well worth walking around Pukekura Park with lakes, a waterfall, gardens, a waterwheel and several lookouts. It’s impossible to get a bad picture on many of the bushwalks nestled in this park. Finally, conquer the steepest 10-minute hike you’re likely to ever experience at Paritutu Rock. 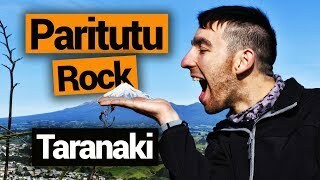 The rock created by Mt Taranki’s volcanic activity can easily be seen at the west side of the city, so walk to it on the Coast Walkway, drive to it at park at the car park beneath it on Paritutu Road, or take a bus to Paritutu Road on weekdays. The short hike reveals an amazing vantage point over New Plymouth, the Sugar Loaf Islands, Back Beach, Mt Taranaki, and you can even see the central North Island volcanoes of Ruapehu from here. The list of walks in New Plymouth goes on, so check out our 8 Wonderful Walks in New Plymouth, Taranaki for more walking inspiration close to the city. The big one. Mt Taranaki, the central volcano in the Taranki region, is surrounded by the heavily forested Egmont National Park. New Plymouth is a great base for hikes in the national park, with mountain shuttle services and good road connections to the mountain. There are hikes from North Egmont, the Dawson Falls Visitor Centre, and a ski field and more hike in East Egmont. The closest national park access to New Plymouth is down Egmont Road to North Egmont. Or visit some of the lesser-known areas of the national park, for instance, down Surf Highway 45 at Lucys Gully, or along Carrington Street. For a full list of hikes in the Egmont National Park, check out Egmont National Park – Guide for Backpackers and 6 Hikes You Have to do in Egmont National Park! Visit the site where a Maori village once stood at Marsland Hill on Robe Street. Grab some cheap eats in the city! There’s a variety of restaurants and pubs doing decent lunch time deals. Feel like a high lord or lady walking in the pretty Tupare Gardens on Mangorei Road, Hurworth. Visit Cape Egmont Lighthouse, surf and visit the remains of shipwrecks and Maori villages along the Surf Highway 45. 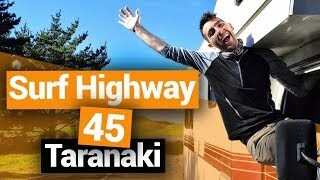 Check out 15 Places to Stop at on Taranaki’s Surf Highway 45. Take a journey into the Forgotten World along the Forgotten World Highway, starting in the nearby town of Stratford. Check out 10 Places You Can’t Miss on the Forgotten World Highway. Play a round of golf with the view of the sea on one side and Mt Taranaki on the other at the New Plymouth Golf Club in Fitzroy. 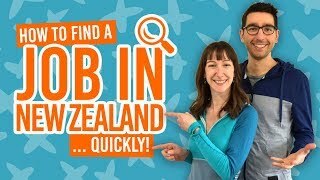 Where to stay in New Plymouth? 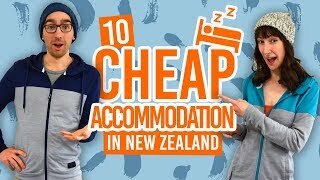 For more information, check out the Accommodation Guide to New Plymouth.